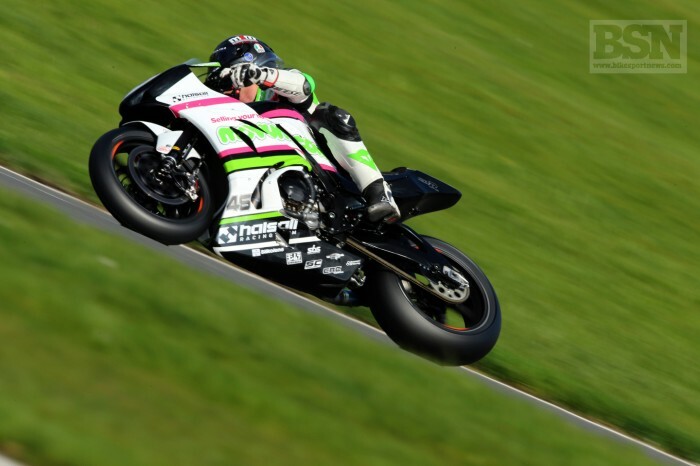 Halsall Racing’s Tommy Bridewell bagged a brace of top-ten finishes at the Bennetts British Superbike round this weekend on what he described as a ‘glorified Superstock bike’. The West Country rider lined up sixth on the grid for Sunday’s first race. Despite losing a few places at the start, he settled into ninth position and held the spot to the chequered flag. His best lap in the opening race gave him a seventh place starting spot for race two later in the afternoon. After a dry race one, the weather had always been set to turn for the second, and true to form the rain hit six laps in, forcing a restart over 22 laps, with the riders lining up in the order they’d been in when the race was stopped. From 10th on the grid, Bridewell got another good start and moved up to eighth as the weather worsened, but was able to stick it out until the end to bag his second top 10. “Overall it has been quite a positive weekend for me, the improvement we’ve made since Donington is clear for all to see so I am happy with two top 10s,” said Bridewell. “But we still have a long way to go and a lot of work to do. Realistically, this is just a glorified Superstock bike with Superbike suspension, brakes and electronics, and we’ve already come quite a way with it since round one.